Of the two readings above that we are focussing on, the moneymaker this week is the passage from Luke, the one that most of your people will mistakenly believe is a sweet Christmasy heart warmer (though you can dissuade them of that later). But before we get to it, we have to spend at least a little time with the words of Micah, who, while calling for a standard militarist messianic solution for a major military crisis of Israel, nonetheless drops some critical lines about the coming of king who was later identified with Jesus. Micah was written during one of the many sieges of Israel, and it’s not at all clear which one this is referring to. One guess is Sennacherib’s attack on Israel in 701 bce, and Micah in 5:1 sound like that: “Now you are walled around with a wall; siege is laid against us; with a rod they strike the ruler of Israel upon the cheek.” However, the word used, “siege,” sounds like words of a century later, when it was Babylonia doing the attacking (cf. 2 Kings 24:10; 25:21; Jer. 52:5), so that could be the one. More important morally and theologically is that while this crisis is happening, there is great turmoil within the city of Jerusalem. Crime, corruption, stealing. The rich have taken all of the good land squeezing the poor onto smaller and smaller plots on which to live. One will come, he says, who is a shepherd; he will bring peace to this mess and will feed the sheep in the midst of them. Luke (and others) will later say that that “shepherd” is the little guy born in the manger in Bethlehem. And mary is “betrothed” (as we used to say) to this other little kid named Joseph, who is just as unknown and obscure as she is. And when he finds out that she’s pregnant, he plans to cut and run (not really a great moral giant for the church today), but an angel comes to him and says, “whoa, stop, the baby in Mary is not yours,” and he says, well, um, I kinda knew that part,” and the angel says, “no no, what I mean is that the baby came from the Holy Spirit (a.k.a., “God”). The little guy in Mary’s womb there is the son of God, so go on back to her now and play like you’re the daddy because that’s what God wants you to do,” and to give Joseph credit, the story says he does that. When Mary hears from an angel that she is to give birth to a child, what she does is to run away. Quite possibly she ran for her life, because there is some historical evidence that when unmarried women were found to be pregnant they were stoned to death. She runs to Judah to another obscure town (which we don’t even hear the name of) to talk to her cousin, Elizabeth, about the whole mysterious and strange occurrence. Elizabeth is evidently pretty old and had been barren for a good many years, and thought she’d never have a baby of her own. But as it happens (that pesky Holy Spirit?) now she’s gotten pregnant herself with a little baby she’ll name John who, as it turns out, will later baptize a gaggle of people (including Jesus), threaten the state, and get himself killed for it, but that’s getting ahead of the story. What caught my eye about this is that this story in Micah is of a Shepherd who will come from the most bland, obscure, “nobody” location, Bethlehem, and wind up feeding the sheep and standing for global peace. There are lots of examples of this. Homiletics.com cites the story of an equally obscure Susan Boyle who looked and dressed plain and dumpy and was way passed her prime, but had a voice that angels would be jealous of. Simon Cowl, the host of the show sneered at her in the beginning, but then later publicly apologized for his behavior. We often overlook the most important things in life. And the Christmas Season (I didn’t say “Christmas,” but the “Christmas season”) encourages us to do that. It encourages us to put everything we’ve got into fake smiles and fake rejoicing (and fake presents) so that the true meaning of Christmas gets lost. It forces us to look the other way. First, the commercialization of the Christmas season works very hard to keep us from realizing that there really is supposed to be something important going on inside this season. We get a lot from the media about how this is a season of caring or giving, but very little about what that is so (with the exception of Fox news, which in the interests of being fair and balanced, gets full-bore CHRISTIAN during this season). (And how do you write something personal about the daughter of your son-in-law’s cousin?). So, you pulled off the corners of all of their cards from last year…didn’t you, I know you did that…and you saved them for this year. And then you have to take them all out and make this big huge database of all of their addresses. And last year about twenty of them bounced and came back because some of these suckers move so often that you’d think they’re in a witness protection program, so you go online, one at a time, and look them up on “addresses.com,” and write them down one at a time. And then you have to sit down and write that Christmas letter that is supposed to go in it. And if you have a family, you know what kind of nightmare that is. You say, “well, little Johnny was a hit singing in that school play,” and Johnny says, “don’t’ tell them about that, that was embarrassing,” and Sally says “don’t tell them I have a boyfriend, because he’s such a dweeb and I just broke up with him,” so by the time you get it finished it’s a letter written by a committee with veto power and nobody likes it, but you’re in a hurry and you have to get it done, so you do it anyway, and you run it off on your home printer and when it comes out, you see that the paper was in crooked and all of them lean to one side, but you say, I have GOT to get this done, so you use them anyway, and you have to write little personal notes on each one of them, saying, “Hi there Bob and Alice, and how’s that little Bobby doing ?” So you fold each and every one of them one at a time and you stuff them into the envelopes and haul three boxes of them down to the Post Office, but you did it on a Saturday and you get there at 2:30 and the post office closes at 2:00 and you have to drive all the way across the state to the UPS store to get them to take your cards. And when you get home you remember that Bob and Alice’s little boy is actually named “Ralph,” and Larry and Sally broke up two years ago because Larry was seeing Alice, and none of them will probably never speak to you again, but you don’t care because it’s late and you want this to be the “right” Christmas. Do we occasionally forget why we are here on earth? Have we forgotten the meaning of Christmas? Have we forgotten who was at the end of the star the Wise Men were chasing? “Judean town in the hill country.” Luke doesn’t give the name of the town, just that it is generally a town of Judah. Judah is about three days walk from Nazareth, so it is at least that far away, and probably a little farther. 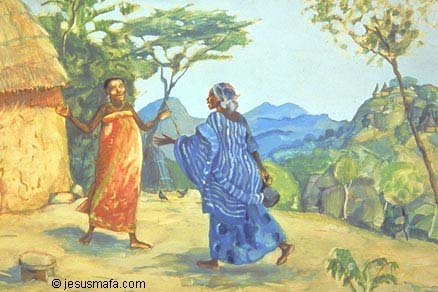 “Two women, not only kin but now drawn by a common experience, meet in an unnamed village in the hills of Judea. The one woman is old and her son will end an old era; the other is young and virgin and her son will usher in the new” (Harper’s Bible Commentary, ed. James Luther Mays (San Francisco: Harper & Row, 1988), p. 1016). “When.” Actually, there is a word here left out of almost all contemporary translations. “The introductory phrase ἐγένετο (egeneto, "it happened that"), common in Luke (69 times) and Acts (54 times), is redundant in contemporary English and has not been translated” (NET). “Blessed are you” (εὐλογέω, eulogeo). Perfect passive participle. “To ask God to bestow divine favor on, with the implication that the verbal act itself constitutes a significant benefit—‘to bless, blessing.’” Louw/Nida, Greek-English Lexicon of the New Testament, 2nd ed. (New York: United Bible Societies, 1996), p. 441.) Note that this is the word upon which our English, “eulogy” is based. This is the first Blessing in the NT. “‘Lord’ is Luke’s most characteristic title for Jesus and his favorite address to him” (Oxford Bible Commentary, ed. John Barton and John Muddiman (New York: Oxford University Press, 2001), Luke 1:39.
 nrsv note: Or believed, for there will be. The word at issue is hoti. It is not certain whether hoti here is “that” or “because.” It makes good sense either way. See also 7:16. This is the first beatitude (“blessing”) in the New Testament and it is similar to the last one in the Gospels spoken to Thomas to discourage his doubt (John 20:29). “This psalm (Luke 1:46-55) is one of the few praise psalms in the NT. Mary praises God and then tells why both in terms of his care for her (Luke 1:46-49) and for others, including Israel (Luke 1:50-55). Its traditional name, the "Magnificat," comes from the Latin for the phrase ‘My soul magnifies the Lord’” (NET). “My spirit” (to pneuma mou). It’s interesting to wonder if there is a theological distinction between “Spirit” here and “soul” (psucheô) in verse 46. The argument is that the soul is the principle of individuality while the spirit is the point of contact between God and humans. This is known as the “trichotomous” theory of human nature (body, soul, and spirit). It’s not clear, however that Luke (or his sources) had anything that complicated in mind. Even the distinction between intellect, emotions, and will is challenged by some psychologists. It is more probable that they are simply synonyms in parallel clauses, following good Hebrew poetic form. “Fear” (phoboumenois). Dative of the present middle participle. Here it is a reverential fear, not fear of harm, cf. Acts 10:2; Colossians 3:22. The bad sense of dread appears in Matthew 21:46; Mark 6:20; Luke 12:4. “Powerful” (dunastas). Our word “dynasty” comes from this word. It comes from dunamai, to have power, to be able. Cn Compare Gk: Meaning of Heb uncertain. Some of the following illustrations were stolen adapted from the very excellent resource, homiletics.com.